Baker, F.C. 1928. 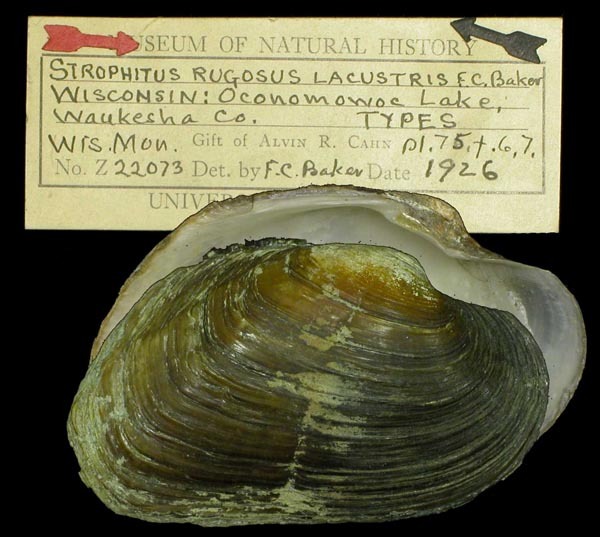 The fresh water Mollusca of Wisconsin. Part II. Pelecypoda. 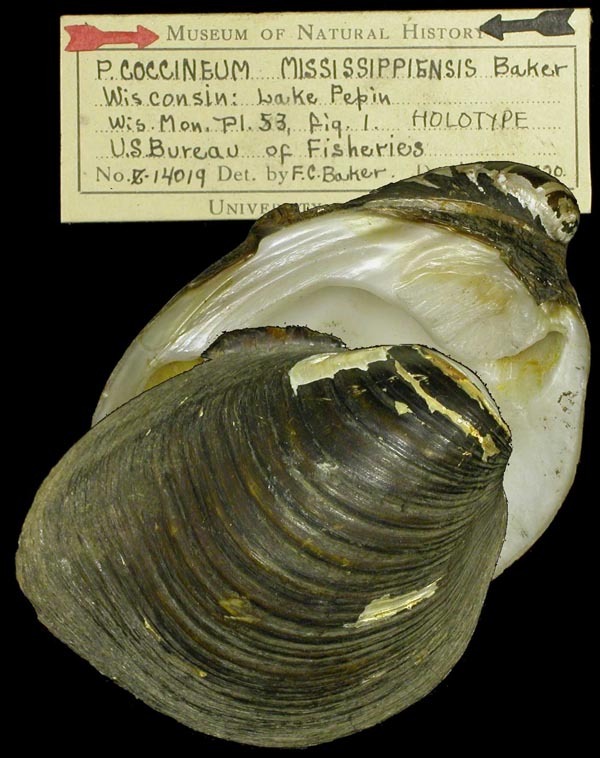 Bulletin of the Wisconsin Geological and Natural History Survey 70(2): vi-495 + 76 plates. Alasmidonta (Decurambis) marginata variabilis F.C. Baker, 1928. F.C. Baker, 1928, Bull. Wisconsin Geol. Nat. Hist. Survey: 194, pl. 69, figs. 4-9. 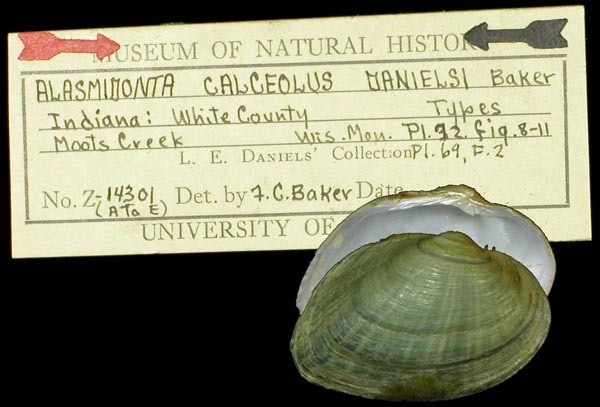 Type(s): LECTOTYPE UMMZ_209183 (selected by Franzen, 1957), Red Cedar R., Chetek, Wis.
Alasmidonta (Pressodonta) calceolus danielsi F.C. Baker, 1928. F.C. Baker, 1928, Bull. Wisconsin Geol. Nat. Hist. Survey: 187, pl. 69, fig. 2; pl. 72, figs. 7-11. Type(s): HOLOTYPE (ORIG. DESIG.) INHS_82276, Moots Creek, White County, Indiana. 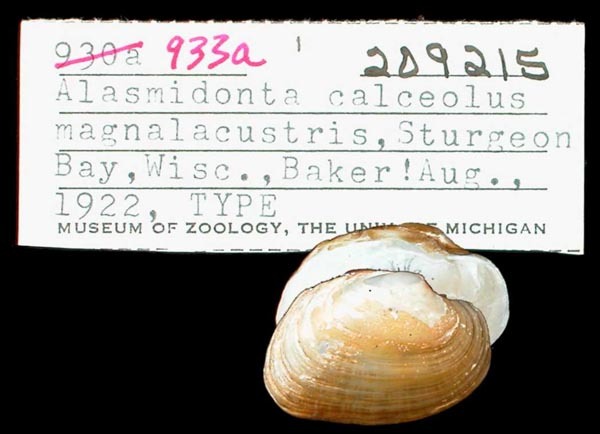 Alasmidonta (Pressodonta) calceolus magnalacustris F.C. Baker, 1928. F.C. Baker, 1928, Bull. Wisconsin Geol. Nat. Hist. Survey: 188, pl. 69, fig. 3; 72, figs. 12-16. Type(s): HOLOTYPE (ORIG. DESIG.) UMMZ_209215, Sturgeon Bay, Wisc. Anodontoides birgei F.C. Baker, 1923. F.C. Baker, 1923, Nautilus: 123. F.C. Baker, 1928, Bull. Wisconsin Geol. Nat. Hist. Survey: 180, pl. 68, figs. 1-4. Type(s): HOLOTYPE (ORIG. DESIG.) UMMZ_209188, Sturgeon Bay, Wisc. Carunculina parva cahni F.C. Baker, 1927. F.C. Baker, 1927, Amer. Midl. Nat. : 222. F.C. Baker, 1928, Bull. Wisconsin Geol. Nat. Hist. Survey: 253, pl. 105, figs. 14-18. Type(s): HOLOTYPE (ORIG. DESIG.) INHS_82281, Neosha Mill Pond, Dodge Co., Wisconsin. Cyclonaias tuberculata compressa F.C. Baker, 1928. F.C. Baker, 1928, Bull. Wisconsin Geol. Nat. Hist. Survey: 107, pl. 75, figs. 1-2. Type(s): HOLOTYPE (ORIG. DESIG.) INHS_82236, Big Vermilion River, 0.5 mi below junction with Middle Fork, [Vermilion Co.], Illinois. Fusconaia undata wagneri F.C. Baker, 1928. F.C. Baker, 1928, Bull. Wisconsin Geol. Nat. Hist. Survey: 64, pl. 40, figs. 1-3. Type(s): HOLOTYPE (ORIG. DESIG.) UMMZ_209194, Lake Pepin, Lake City, Minnesota. 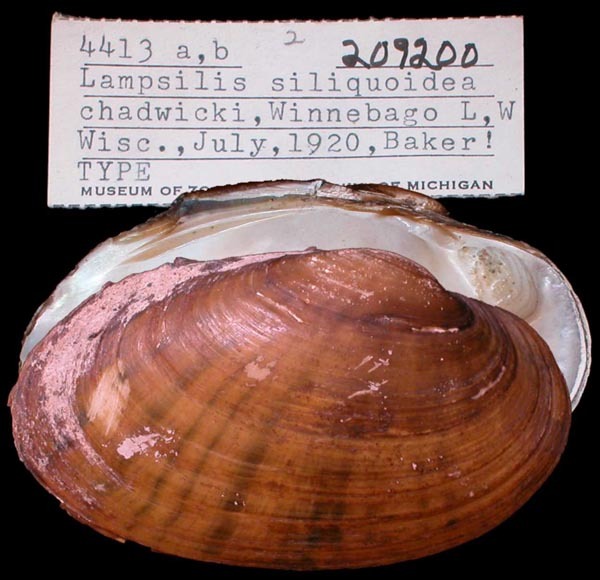 Lampsilis siliquoidea chadwicki F.C. Baker, 1928. F.C. Baker, 1928, Bull. Wisconsin Geol. Nat. Hist. Survey: 279, pl. 91, figs. 5-8. Type(s): LECTOTYPE UMMZ_209200 (selected by Franzen, 1957), Lake Winnebago, Wisconsin. Lampsilis siliquoidea pepinensis F.C. Baker, 1927. F.C. Baker, 1927, Amer. Midl. Nat. : 223. F.C. Baker, 1928, Bull. Wisconsin Geol. Nat. Hist. Survey: 275, pl. 90, figs. 2-5. Type(s): LECTOTYPE UMMZ_209208, L. Pepin, Lake City, Minnesota. Lampsilis ventricosa perglobosa F.C. Baker, 1928. F.C. Baker, 1928, Bull. Wisconsin Geol. Nat. Hist. Survey: 285, pl. 93, figs. 1-4. Type(s): HOLOTYPE (ORIG. DESIG.) UMMZ_209195, Lake Pepin, Lake City, Minnesota. Lampsilis ventricosa winnebagoensis F.C. Baker, 1928. F.C. Baker, 1928, Bull. Wisconsin Geol. Nat. Hist. Survey: 291, pl. 94, figs. 1-4. Type(s): HOLOTYPE (ORIG. DESIG.) UMMZ_209212, L. Winnebago, nr. Oshkosh, Wis.
Lasmigona costata nuda F.C. Baker, 1928. F.C. Baker, 1928, Bull. Wisconsin Geol. Nat. Hist. Survey: 145, pl. 59, fig. 3-6. Type(s): HOLOTYPE (ORIG. DESIG.) UMMZ_209131, Red Cedar R., Chetek, Wis.
Lasmigona costata pepinensis F.C. Baker, 1928. F.C. Baker, 1928, Bull. Wisconsin Geol. Nat. Hist. Survey: 144, pl. 59, figs. 1-2. Type(s): HOLOTYPE (ORIG. DESIG.) UMMZ_209133, L. Pepin, Wisconsin. Pisidium fallax pressum F.C. Baker, 1928. F.C. Baker, 1928, Bull. Wisconsin Geol. Nat. Hist. Survey: ??. Quadrula (Quadrula) quadrula bullocki F.C. Baker, 1928. F.C. Baker, 1928, Bull. Wisconsin Geol. Nat. Hist. Survey: 87, pl. 46, figs. 1-3. Type(s): HOLOTYPE (ORIG. DESIG.) UMMZ_209203, Fox River, nr. De Pere, Wisc. Sphaerium bakeri F.C. Baker, 1928. ‘Sterki’ F.C. Baker, 1928, Bull. Wisconsin Geol. Nat. Hist. Survey: ??. Sphaerium flavum var. foxense F.C. Baker, 1928. Sphaerium solidulum var. winnebagoense F.C. Baker, 1928. Strophitus rugosus lacustris F.C. Baker, 1928. F.C. Baker, 1928, Bull. Wisconsin Geol. Nat. Hist. Survey: 207, pl. 75, figs. 6-8. Type(s): HOLOTYPE (ORIG. DESIG.) INHS_82463, Oconomowoc Lake, Waukesha Co., Wisconsin. Strophitus rugosus pepinensis F.C. Baker, 1928. F.C. Baker, 1928, Bull. Wisconsin Geol. Nat. Hist. Survey: 204, pl. 74, fig. 8. Type(s): HOLOTYPE (ORIG. DESIG.) UMMZ_209137, L. Pepin, Lake City, Wisc. Strophitus rugosus winnebagoensis F.C. Baker, 1928. F.C. Baker, 1928, Bull. Wisconsin Geol. Nat. Hist. Survey: 205, pl. 74, figs. 1-6. Type(s): HOLOTYPE (ORIG. DESIG.) UMMZ_209201, Lake Winnebago, Wisconsin. Utterbackia imbecillis fusca F.C. Baker, 1927. F.C. Baker, 1928, Bull. Wisconsin Geol. Nat. Hist. Survey: 175, pl. 103, figs. 12-14. Type(s): HOLOTYPE (ORIG. DESIG.) UMMZ_209141, Sturgeon Bay, Wisc. Actinonaias carinatus (Barnes, 1823). — F.C. Baker (1928: 218). Alasmidonta (Decurambis) marginata Say, 1819. — F.C. Baker (1928: 189). Alasmidonta (Decurambis) marginata truncata (Wright, B.H., 1898). — F.C. Baker (1928: 192). Alasmidonta (Decurambis) marginata variabilis Nov. Var. — F.C. Baker (1928: 194). 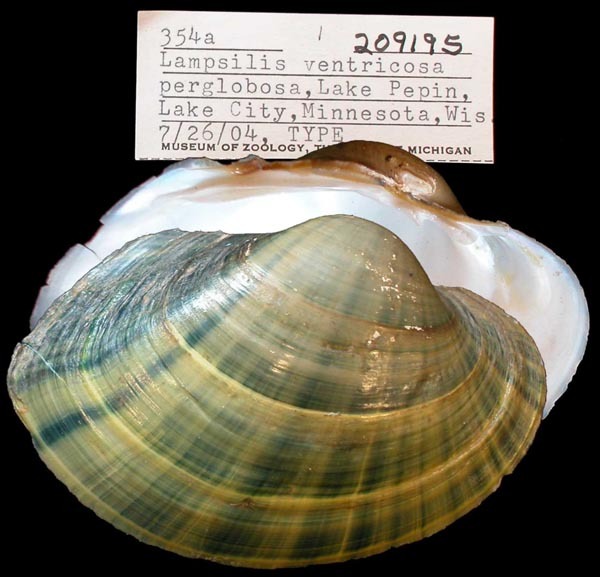 Alasmidonta (Pressodonta) calceolus (Lea, 1830). — F.C. Baker (1928: 185). Alasmidonta (Pressodonta) calceolus danielsi Var. Nov. — F.C. Baker (1928: 187). 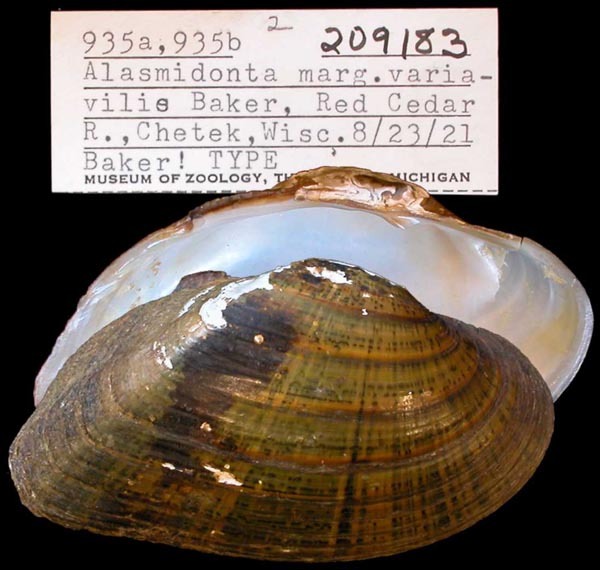 Alasmidonta (Pressodonta) calceolus magnalacustris Var. Nov. — F.C. Baker (1928: 188). 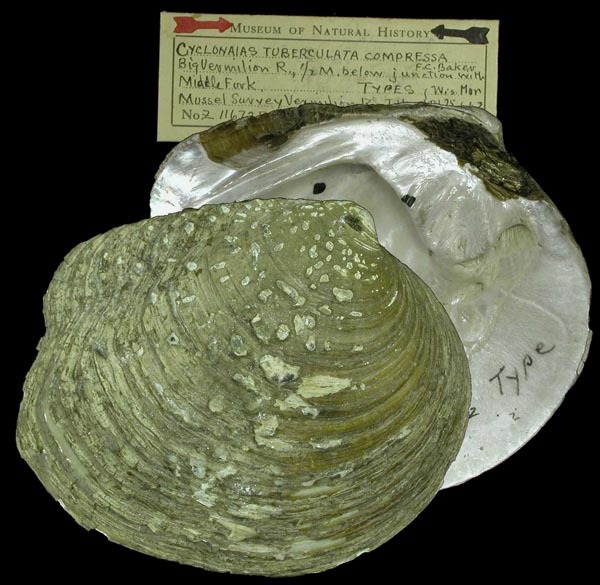 Amblema costata Rafinesque, 1820. — F.C. Baker (1928: 80). Amblema peruviana (Lamarck, 1819). — F.C. Baker (1928: 73). Amblema rariplicata (Lamarck, 1819). — F.C. Baker (1928: 76). Anodonta cataracta Say. — F.C. Baker (1928: 300). Anodonta corpulenta Cooper, 1834. — F.C. Baker (1928: 168). Anodonta gigantea Lea, 1834 [sic]. — F.C. Baker (1928: 161). Anodonta grandis Say, 1829. — F.C. Baker (1928: 152). Anodonta grandis footiana Lea, 1840. — F.C. Baker (1928: 157). Anodonta grandis plana Lea, 1834. — F.C. Baker (1928: 155). Anodonta kennicottii Lea, 1861. — F.C. Baker (1928: 163). Anodonta marginata Say, 1917 [sic]. — F.C. Baker (1928: 165). 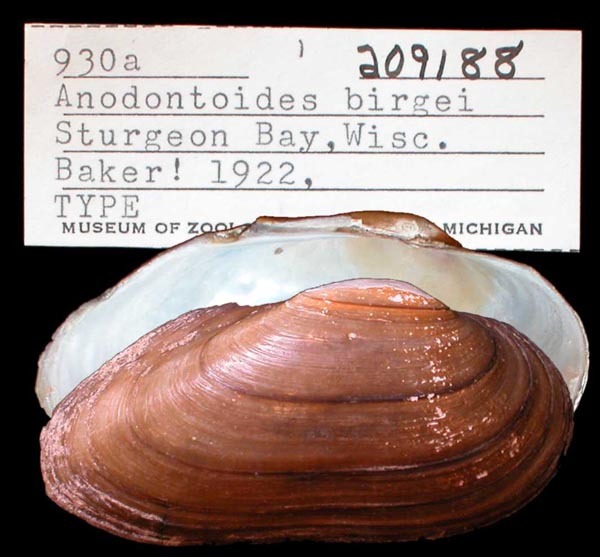 Anodontoides birgei Baker, F.C., 1923. — F.C. Baker (1928: 180). Anodontoides ferussacianus (Lea, 1834). — F.C. Baker (1928: 175). Anodontoides ferussacianus subcylindraceus (Lea, 1838). — F.C. Baker (1928: 178). Arcidens confragosus (Say, 1829). — F.C. Baker (1928: 196). Carunculina parva (Barnes, 1823). — F.C. Baker (1928: 251). 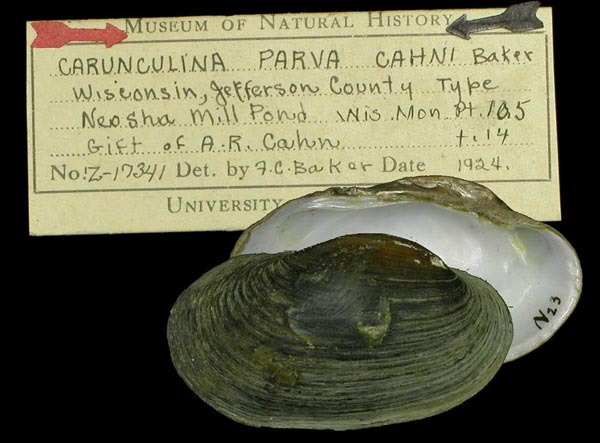 Carunculina parva cahni (Baker, F.C., 1927). — F.C. Baker (1928: 253). Cyclonaias tuberculata (Rafinesque, 1820). — F.C. Baker (1928: 103). 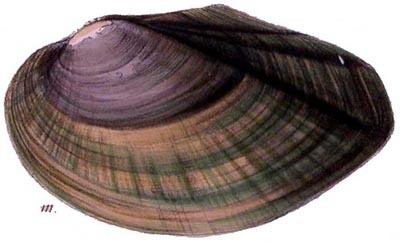 Cyclonaias tuberculata compressa. — F.C. Baker (1928: 107). Cyclonaias tuberculata granifera (Lea, 1838). — F.C. Baker (1928: 107). Dysnomia flexuosa (Raf.). — F.C. Baker (1928: 296). Dysnomia (Truncillopsis) triqueter (Rafinesque, 1820). — F.C. Baker (1928: 296). Elliptio complanatus (Dillwyn, 1817). — F.C. Baker (1928: 134). Elliptio crassidens (Lamarck, 1819). — F.C. Baker (1928: 131). Elliptio dilatatus (Rafinesque, 1820). — F.C. Baker (1928: 124). Elliptio dilatatus delicatus (Simpson, 1900). — F.C. Baker (1928: 128). 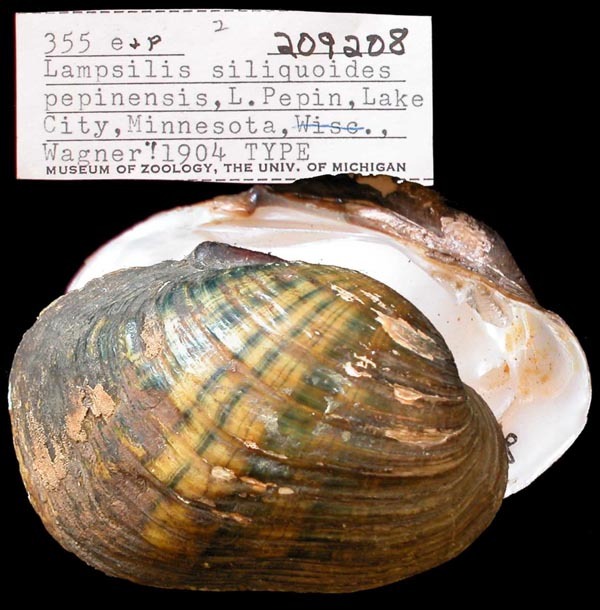 Elliptio dilatatus sterkii Grier, 1918. — F.C. Baker (1928: 130). Fusconaia ebenus (Lea, 1831). — F.C. Baker (1928: 66). 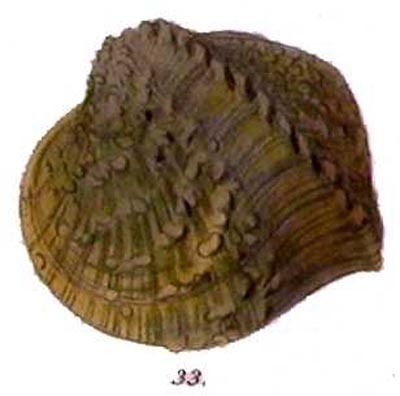 Fusconaia flava (Rafinesque, 1820). — F.C. Baker (1928: 53). 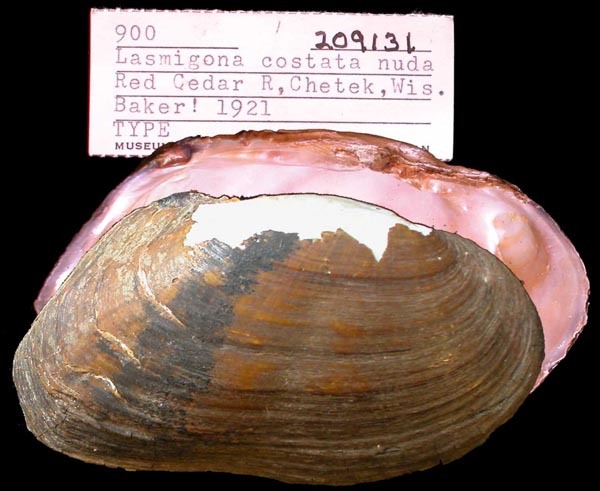 Fusconaia flava parvula Grier, 1918. — F.C. Baker (1928: 58). Fusconaia undata (Barnes, 1823). — F.C. Baker (1928: 59). Fusconaia undata trigona (Lea, 1831). — F.C. Baker (1928: 63). Fusconaia undata wagneri Nov. Var. — F.C. Baker (1928: 64). Lampsilis anodontoides (Lea, 1834). — F.C. Baker (1928: 266). Lampsilis borealis (Gray). — F.C. Baker (1928: 302). Lampsilis cariosa (Say). — F.C. Baker (1928: 301). Lampsilis fallaciosa (Smith, 1899) Simpson. — F.C. Baker (1928: 268). Lampsilis higginsii (Lea, 1857). — F.C. Baker (1928: 293). Lampsilis radiata (Gmelin). — F.C. Baker (1928: 301). Lampsilis siliquoidea (Barnes, 1823). — F.C. Baker (1928: 270). Lampsilis siliquoidea chadwicki Var. Nov. — F.C. Baker (1928: 279). 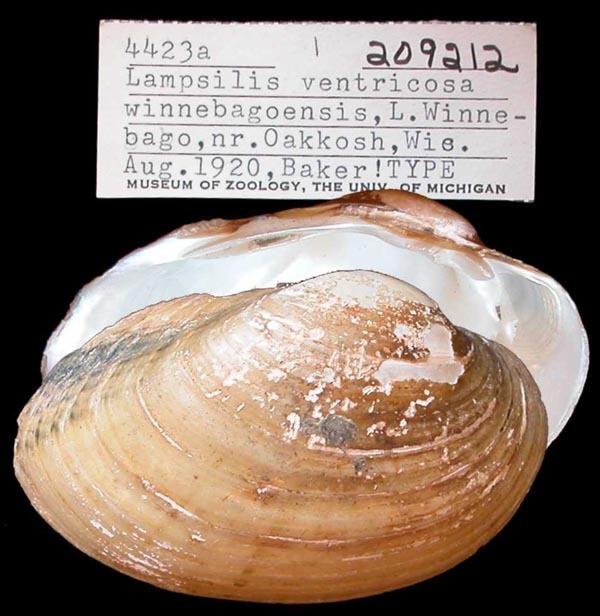 Lampsilis siliquoidea pepinensis (Baker, F.C., 1927). — F.C. Baker (1928: 275). Lampsilis siliquoidea rosacea (DeKay, 1843). — F.C. Baker (1928: 277). Lampsilis superiorensis (Marsh). — F.C. Baker (1928: 302). Lampsilis ventricosa (Barnes, 1823). — F.C. Baker (1928: 281). Lampsilis ventricosa lurida (Simpson, 1914). — F.C. Baker (1928: 289). Lampsilis ventricosa occidens (Lea, 1829). — F.C. Baker (1928: 286). Lampsilis ventricosa perglobosa Var. Nov. — F.C. Baker (1928: 285). Lampsilis ventricosa winnebagoensis Var. Nov. — F.C. Baker (1928: 291). Lasmigona (Platynaias) compressa (Lea, 1829). — F.C. Baker (1928: 139). Lasmigona (Pterosyna) complanata (Barnes, 1823). — F.C. Baker (1928: 147). Lasmigona (Pterosyna) complanata katherinae (Lea, 1838). — F.C. Baker (1928: 151). Lasmigona (s.s.) costata (Rafinesque, 1820). — F.C. Baker (1928: 141). Lasmigona (s.s.) costata nuda Nov. Var. — F.C. Baker (1928: 145). Lasmigona (s.s.) costata pepinensis Nov. Var. — F.C. Baker (1928: 144). Leptodea fragilis (Rafinesque, 1820). — F.C. Baker (1928: 234). 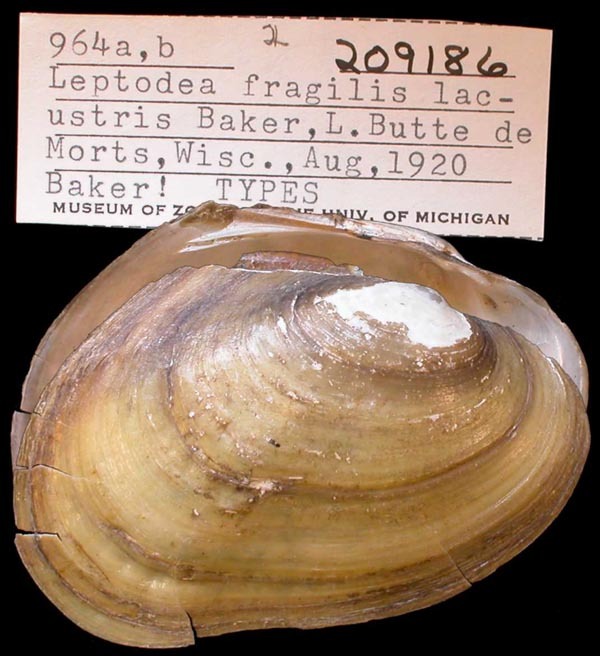 Leptodea fragilis lacustris (Baker, F.C., 1922). — F.C. Baker (1928: 237). 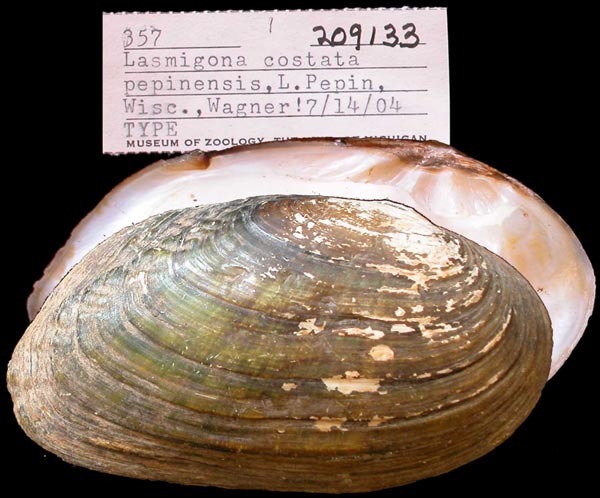 Leptodea leptodon (Rafinesque, 1820). — F.C. Baker (1928: 239). Ligumia subrostratus (Say). — F.C. Baker (1928: 300). Ligumia (Micromya) ellipsiformis (Conrad, 1836). — F.C. Baker (1928: 263). Ligumia (Micromya) iris novieboraci (Lea, 1838). — F.C. Baker (1928: 260). Ligumia (s.s.) recta (Lamarck, 1819). — F.C. Baker (1928: 255). Ligumia (s.s.) recta latissima (Rafinesque, 1820). — F.C. Baker (1928: 257). Margaritana (Cumberlandia) monodonta (Say, 1829). — F.C. Baker (1928: 48). Megalonaias gigantea (Barnes, 1823). — F.C. Baker (1928: 69). Obliquaria reflexa Rafinesque, 1820. — F.C. Baker (1928: 210). Obovaria (Pseudoon) olivaria (Rafinesque, 1820). — F.C. Baker (1928: 214). Plagiola lineolata (Rafinesque, 1820). — F.C. Baker (1928: 231). 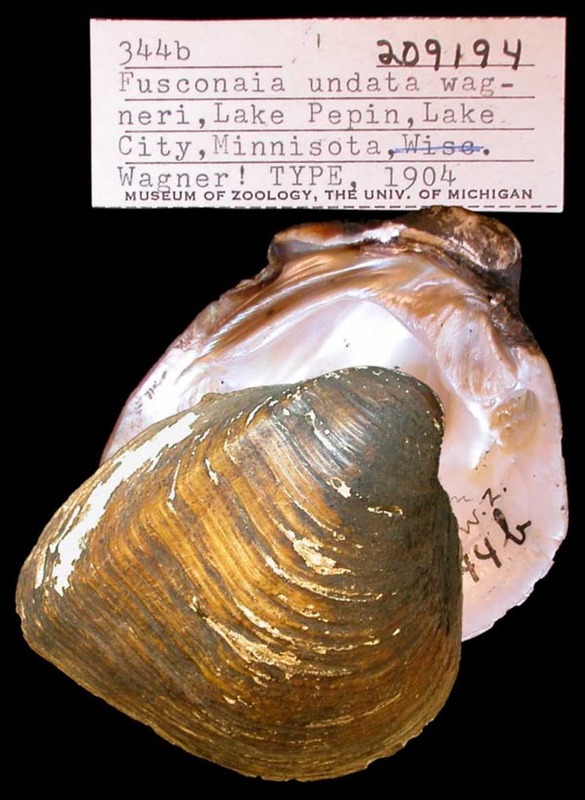 Plethobasus cyphyus (Rafinesque, 1820). — F.C. Baker (1928: 110). Pleurobema clava (Lam.). — F.C. Baker (1928: 113). Pleurobema coccineum (Conrad, 1836). — F.C. Baker (1928: 113). Pleurobema coccineum catillus (Conrad, 1836). — F.C. Baker (1928: 117). Pleurobema coccineum mississippiensis Var. Nov. — F.C. Baker (1928: 121). Pleurobema coccineum solida (Lea, 1838). — F.C. Baker (1928: 118). Proptera alata (Say, 1817). — F.C. Baker (1928: 241). Proptera alata megaptera (Rafinesque, 1820). — F.C. Baker (1928: 244). Proptera capax (Green, 1832). — F.C. Baker (1928: 248). Proptera laevissima (Lea, 1830). — F.C. Baker (1928: 247). Ptychobranchus fasciolaris (Rafinesque). — F.C. Baker (1928: 300). Quadrula (s.s.) fragosus (Conrad, 1836). — F.C. Baker (1928: 88). Quadrula (s.s.) nodulata (Rafinesque, 1820). — F.C. Baker (1928: 95). Quadrula (s.s.) pustulosus (Lea, 1834). — F.C. Baker (1928: 90). Quadrula (s.s.) pustulosus prasina (Conrad, 1834). — F.C. Baker (1928: 93). 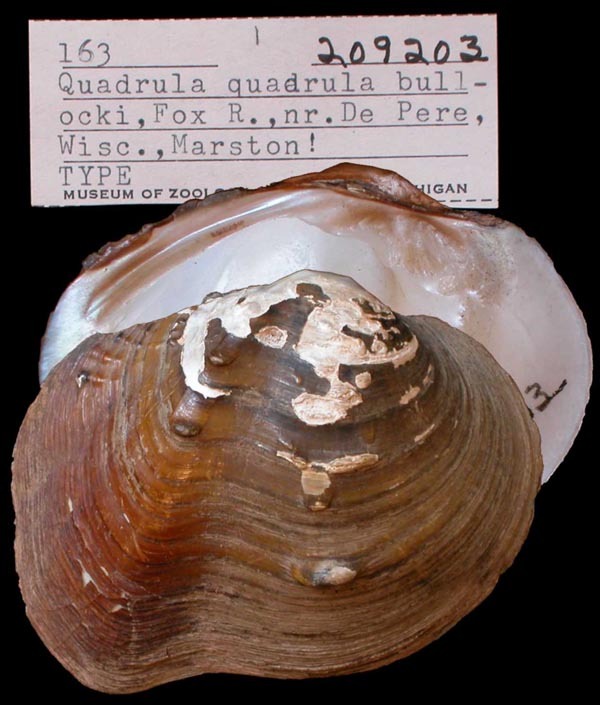 Quadrula (s.s.) quadrula (Rafinesque, 1820). — F.C. Baker (1928: 84). Quadrula (s.s.) quadrula bullocki Nov. Var. — F.C. Baker (1928: 87). Quadrula (sec. Orthonymus) metanevra (Rafinesque, 1820). — F.C. Baker (1928: 97). Simpsoniconcha ambigua (Say, 1825). — F.C. Baker (1928: 183). Sphaerium aureum (Prime). — F.C. Baker (1928: 321). Sphaerium aureum declive Sterki. — F.C. Baker (1928: 320). Sphaerium crassum Sterki. — F.C. Baker (1928: 318). Sphaerium simile (Say). — F.C. Baker (1928: 313). Sphaerium simile planatum Sterki. — F.C. Baker (1928: 317). Strophitus rugosus (Swainson, 1822). — F.C. Baker (1928: 198). 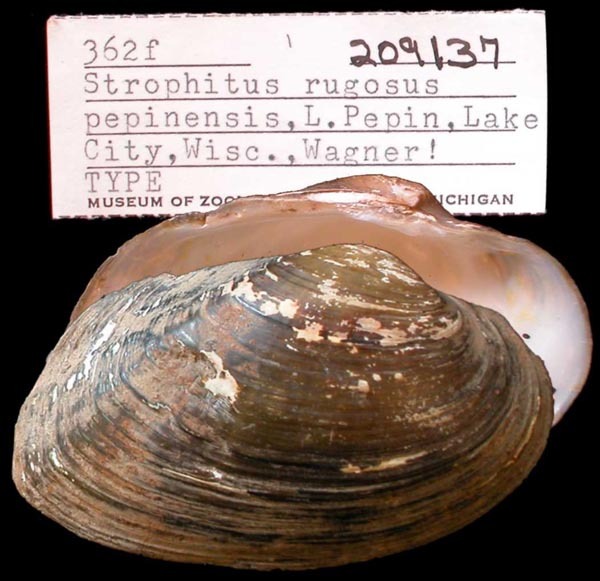 Strophitus rugosus lacustris Var. Nov. — F.C. Baker (1928: 207). Strophitus rugosus pavonius (Lea, 1836). — F.C. Baker (1928: 202). Strophitus rugosus pepinensis Var. Nov. — F.C. Baker (1928: 204). 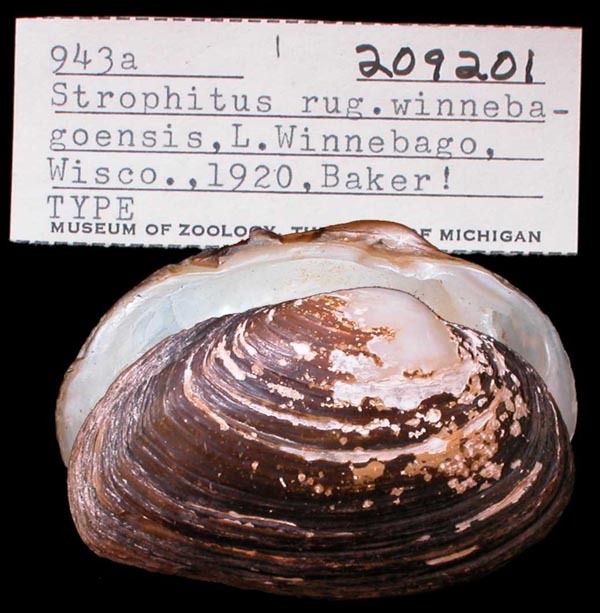 Strophitus rugosus winnebagoensis Var. Nov. — F.C. Baker (1928: 205). Tritogonia verrucosa (Rafinesque, 1820). — F.C. Baker (1928: 100). Truncilla donaciformis (Lea, 1828). — F.C. Baker (1928: 228). Truncilla truncata Rafinesque, 1820. — F.C. Baker (1928: 224). 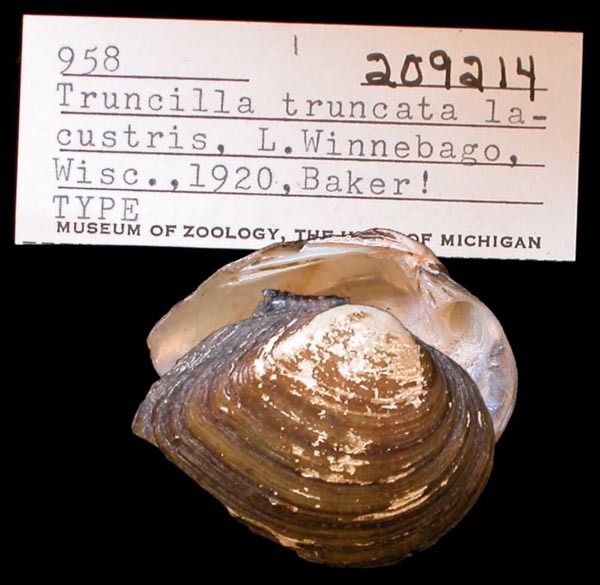 Truncilla truncata lacustris Var. Nov. — F.C. Baker (1928: 227). Uniomerus tetralasmus sayi (Ward). — F.C. Baker (1928: 137). Utterbackia imbecillis (Say, 1829). — F.C. Baker (1928: 172). 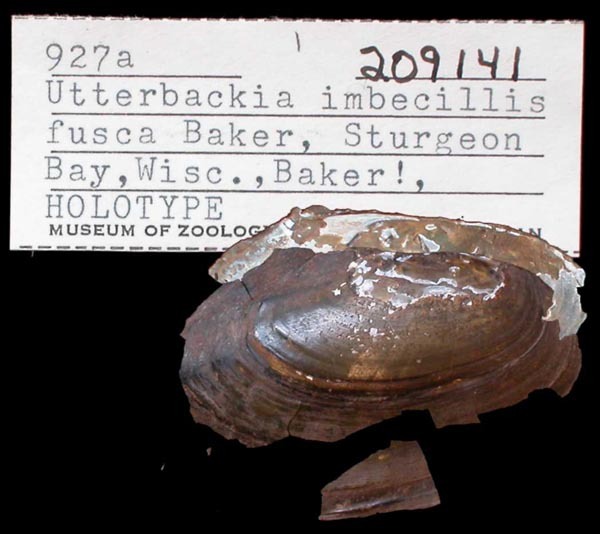 Utterbackia imbecillis fusca Baker, F.C., 1927. — F.C. Baker (1928: 175).